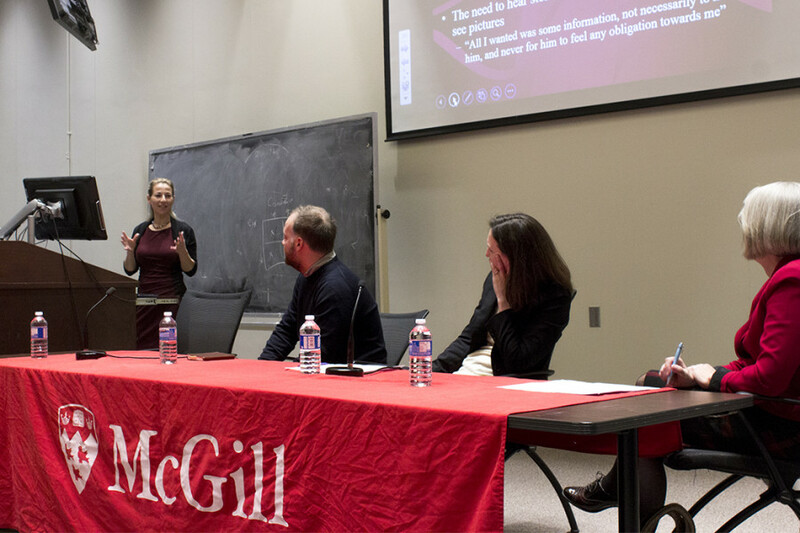 Bioethics professor Vardit Ravitsky approaches the podium and stops before addressing the people seated before her in McGill University’s Chancellor Day Hall. Glancing around the room, she asks the audience a question that creates a pregnant pause. Ravitsky discussed how some parents who used sperm or egg donor services want to keep donor identities secret in order to have control over the relationship with their children. In some cases, the donors themselves request anonymity, to avoid certain issues like child welfare and other financial responsibilities. Ravitsky gave the example of a donor clinic in the United States that recently went bankrupt. It had many records of donors stashed away in a shed rented for safekeeping. But the clinic ran out of funds and was soon unable to continue paying rent. They lost all the records, “the genetic origins of thousands who may have wanted access to that information,” according to Ravitsky who shook her head before proceeding with the panel. The wellbeing of “donor conceived” individuals was the main focus of the discussion. There are many different reasons they could have for wanting to know the identity of their donor: some wish to know their medical history, while others place urgency on knowing and being able to obtain the missing piece to their identity. “Would you tolerate being told you had no right to any of that? Denied access to your roots?” Ravitsky said. On the other hand, Gruben spoke more about the legal issues concerning sperm and egg registries. She brought up the 2013 Pratten v British Columbia court case as one example. “[Olivia] Pratten had challenged the provincial rules around disclosure information to donor-conceived offspring,” she said. Pratten herself was conceived from a donor and wished to gain access to his or her identity and to help others who wished to do the same. “[Pratten] argued that she had a freestanding right to know her genetic origins,” Gruben said. Pratten also argued that B.C.’s adoption registration was discriminatory to donor-conceived people. Pratten’s second argument succeeded, the judge agreed that there was discrimination against donor offspring, but her first argument failed. Pratten is still being withheld from her by the clinic. All three speakers restated the same point: that donor-conceived individuals who are denied access to their donor’s information will suffer psychological distress and struggle with identity formation, all while hereditary medical issues go unnoticed. And there’s always that fear of accidentally getting romantically involved with your half-sibling. This repetition left some attendees feeling as though the discussion was one-sided.